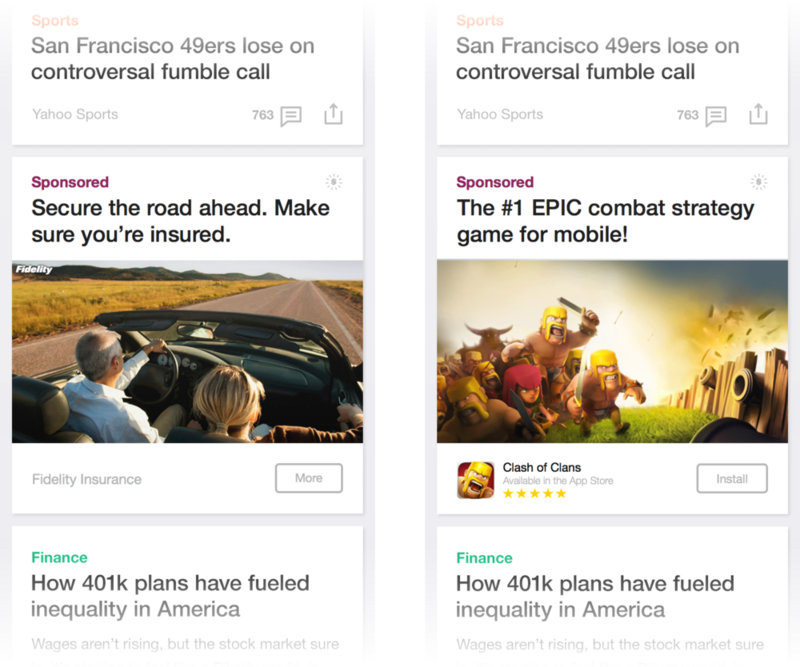 In 2014 I served as the sole designer for the Yahoo Mobile Ads SDK, a service that delivered native ads in a variety of templates across Yahoo’s suite of over 15 mobile apps, including Yahoo News, Weather, Finance, Digest, Sports and Fantasy Sports. Each ad template consisted of a set of variable properties (text fields, images, numerical values) that were then interpreted by our SDK and rendered in-app. Each ad had a set of requirements advertisers adhered to— for example, image ads rendered images of a specific set of sizes, and all text fields had character count limits. The SDK supported both iOS and Android, so I produced platform specific, width-responsive designs for all templates, as well as designs for oversized form-factors on tablet. Additionally, apps had different styling requirements depending on their component library, so I produced matching component libraries and style sheets across the entire app suite. All-in-all, I produced 52 unique ad formats during my tenure in this position. Example specs for an app-install ad. Each of these objects consisted of 7 modifier fields: Title Text, Image, App Icon, App Name, Tagline or No. Users, App Store Rating, and CTA. Beyond the maintenance of existing ad formats, I also designed new types of ad formats that Yahoo now uses across their app suite. I designed the motion behavior and interaction design for the multi-ad carousel, oversaw the launch of video ads across mobile apps, and spearheaded the design of the collapsible text / image format now found in Yahoo mail, which allows for rich advertising within information-dense contexts. This ad format tracks both impressions and clicks. Tapping parts of the ad cell expands the ad to a full image or video ad. A consequence of this format was that the expand/collapse interaction lowered the clickthrough rate of ads. However, it was able to capture explicit impression data while minimizing accidental clickthroughs, which are notoriously bad experiences. The format is still in use today. 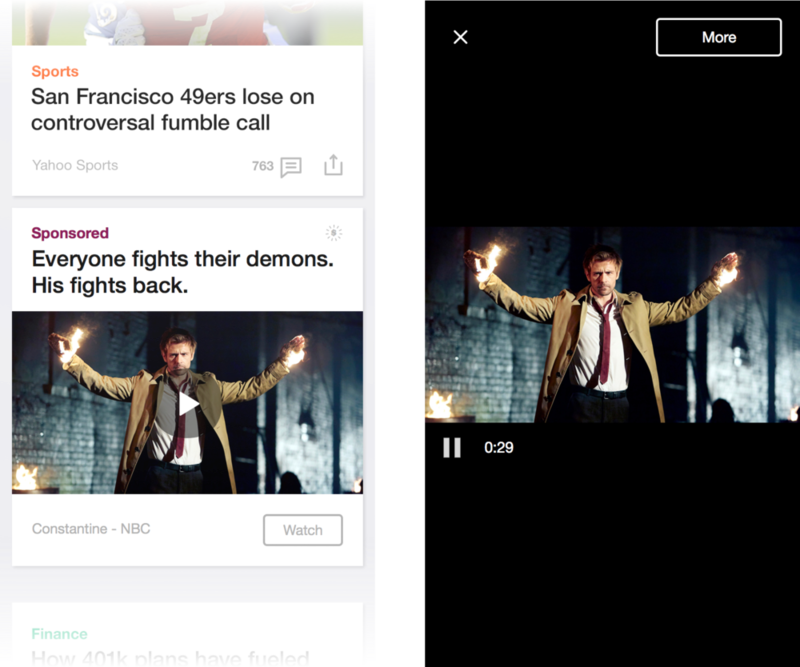 Video ads will silently auto-play from the stream, but expand to a full screen mode when clicked, at which point sound becomes enabled. Full-screen also supports landscape mode. Interspersed between articles, these ad formats allowed for more detailed product description. 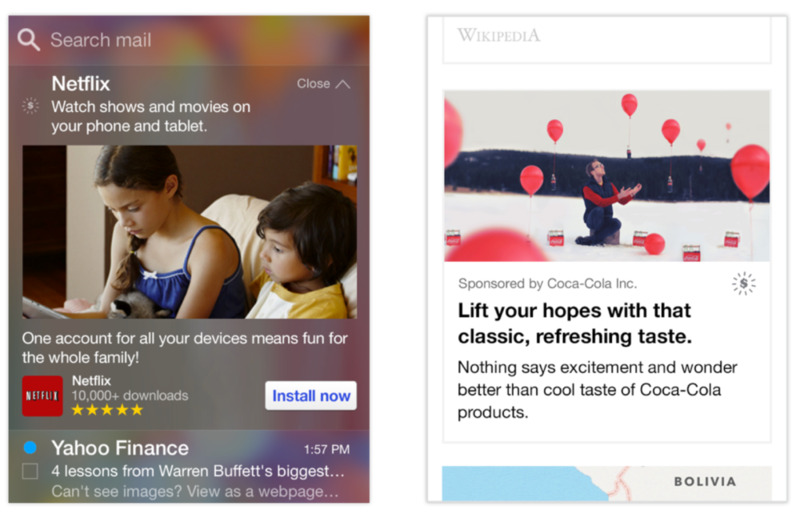 The best example of my ads work can be found in the new Yahoo iOS app. Download the app here.